The Chinese studio Urbanus has designed a symbolic building to house the library of South University of Science and Technology (SUST) in Shenzhen. The SUST university library offers Urbanus an opportunity to rethink places of learning and social relationships in the big city. 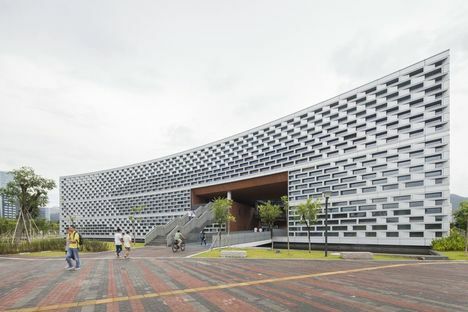 Urbanus is a Chinese studio to which the city of Shenzhen has entrusted the design of an important social and cultural centre for youth, the library in South University of Science and Technology (SUST). Urbanus’s many urban development projects in their home city, Shenzhen, have given them an in-depth familiarity with the dynamics of change in this metropolis in southeast China. 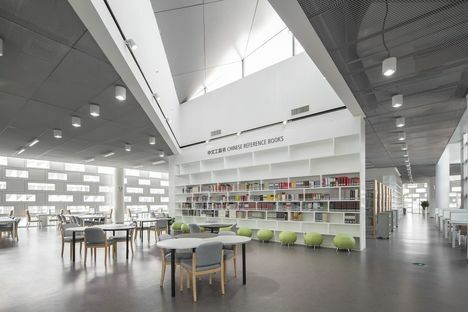 The library, located in a new separate building on the university campus, is the product of reflection on today’s lifestyles and our very way of perceiving an institutional building, not only in the context of study but as a destination in itself. The loss of physicality in interpersonal relationships and the frequency and fluidity of movement from one place to another, spending less time in each place, drove Urbanus to conceive the library as a symbolic monument to co-presence and dialogue, assigning great importance to places where people meet, stop and talk in the building. For years now the internet has led us to think that information and knowledge can no longer be obtained (solely) by going to a temple of knowledge, such as the libraries that have been the seats of knowledge for centuries. Now that we can carry this knowledge around with us in our pockets, in the era of web 3.0 Urbanus expresses, in the architecture of the SUST library, the idea that knowledge is more than just learning, but also teaching, mediated by the social relationship. The design of the building, with its imposing GRC (Glass Fiber Reinforced Concrete) structure and enigmatic aluminium strip façades, centres around two wide pedestrian pathways which in turn give rise to cross-connections cutting across the building’s rectangular floor plan on 3 levels from north to south and from west to east. 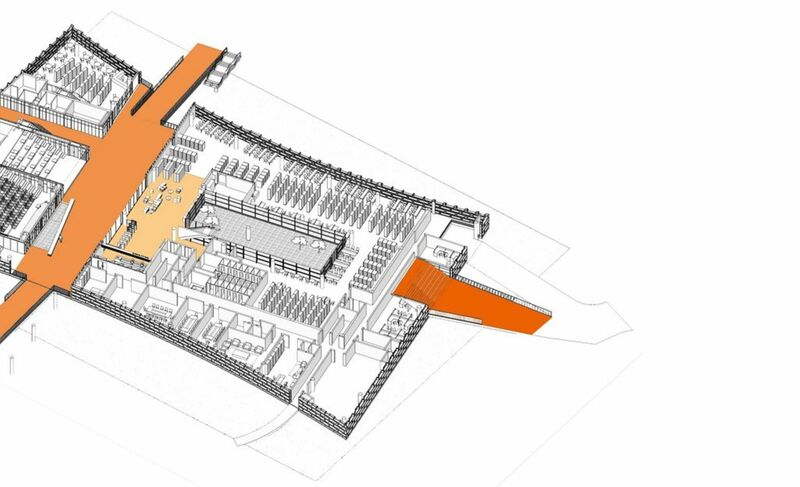 Like the cardo and decumanum of a Roman city, or the big shopping galleries of Cantonese tradition, say the architects at Urbanus, the two axes divide and join different areas in the building’s programme; and, physically and visually crossing at multiple points, they bring to mind the network of contacts, knowledge, and information that the library as a place for meeting can still provide. Passing the pool of water in the centre of which the building is constructed, the pathway on the northern side leads to the main entrance on the ground floor, where the lobby of the library is located. Walking along the open corridor, we come to the building’s public areas, the auditorium, the spaces for the associations’ activities, and finally, the bar. A mantle of orange concrete panels underlines its logistical and relational importance. The route on the first level is more internal, crossing the complex from west to east and repeatedly overlooking the courtyard gardens on the lower level, accessible via a series of staircases. In its overall vision and reading in terms of images, the building may remind some readers of Escher’s engravings or the powerful inventive construction of the library of the Benedictine monastery where Umberto Eco’s novel “The name of the rose” is set.